We are fortunate that our delightful breed is basically healthy as there are no extreme exaggerations in the conformation as there can be in some other pedigree dogs. Care is indeed mostly a matter of common sense and observation. With warmth, cleanliness, good quality food, fresh air and exercise and most of all your tender loving care these little dogs can live long and happy lives, the average lifespan being about 14 to 15 years, with many living even longer. Genetic problems are few, but must be taken seriously if they are not to affect our breed's future welfare. Warmth is particularly important for this breed and although they keep quite warm when exercising they do appreciate being covered over when inactive and sleeping. There are many 'envelope beds' on the market and they are a must for this breed- or of course your duvet will do! Italian Greyhounds are also a 'contact breed' i.e. they simply love being close to you. If you want a dog that sits on the floor by your feet please do not consider having this breed! An Italian that does not have enough human contact will not thrive. This is not a substitute for a veterinary page so if your dog has any health problems you are urged to seek veterinary advice as soon as possible. All we hope to achieve is the continued good health of your dogs with some general advice which may be of use. It is always a good idea to have a special medicine cabinet for your dogs for those little emergencies. Make sure by checking periodically that nothing is past it's 'sell by' date! There are many differing opinions about the type and frequency of vaccinations. The most sensible course is to find a vet that you have confidence in and listen to his/her advice. When you first get your puppy make sure you know exactly what has been administered if anything. If your puppy has had any vaccinations you should be given a vaccination record card by the breeder. There is some evidence that yearly vaccinations may be detrimental to the health of your dog. It is wise that you research this area. Twice yearly worming is essential in adult dogs but young puppies need more frequent worming. Here it is best to let your vet give you advice. Never neglect to do a proper worming routine. Personally I find Drontal to be safe and effective but different breeders sometimes prefer other brands. Again I would urge you to seek advice from your vet rather than buying from a pet shop as 'over the counter' products are rarely as safe or effective. It is always wise to get to know and trust your vet. If this is your first dog then ask other owners in your area to help in finding a good and sympathetic person. Always seek veterinary advice sooner rather than later if you are at all worried about your dogs health. It can save a lot of pain and distress if an illness is treated as soon as possible. It is also essential to ask your vet if he/she is aware of the special problems with sighthounds and anaesthetics. Most Small Animal practices are aware of the problems, but it is as well to be sure before an emergency arises. With modern veterinary skills it is quite unusual for there to be anything to worry about. 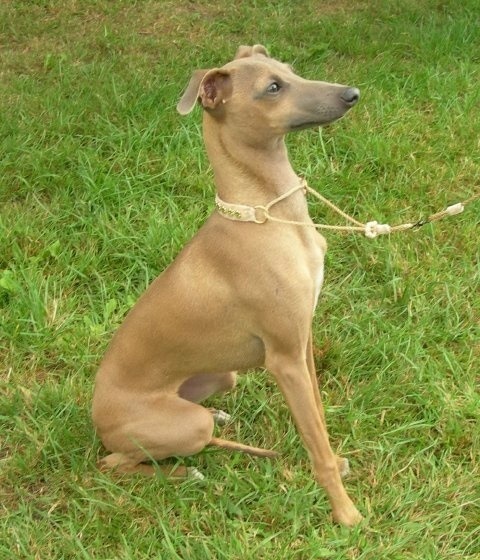 Some Italian Greyhounds may suffer from alopecia, or baldness. There can be many different causes including hypothyroidism, skin infections, allergies or colour dilute alopecia ( CDA ) most commonly found in blue or blue fawns although not unknown in other colours as well and generally thought to be incurable. CDA is a very complex subject and will no doubt be dealt with at length at a later date. It is carried by a recessive gene and is found in other breeds as well. The answer is of course, is to pay strict attention to hygiene which is not difficult with a fine coated breed like ours. Bedding should be washed regularly and it pays to be extra vigilant after attending shows as fleas like a change of dog! Treating periodically with a product such as Frontline can be useful. One of the questions most often asked about Italians is the possibility of leg breaks. There are many reasons for an I.G. or indeed any dog, to break a leg. Their long fine graceful limbs being more easily broken than a short thick leg. Think of putting pressure on a long pencil and then putting the same pressure on a short stub of pencil. Many of them are also fearless, particularly when young, having a definite 'I can fly' mentality. I have often said it is much like running a mini on a Rolls Royce engine! The incidence of leg breaks seem to be greater in some lines than others. This could be because of a difference in bone density, not to be confused with heaviness of bone. It could also be that some breeders keep their dogs confined to small areas or crates for much of the time. In this situation a puppy never experiences what it can safely do and as soon as it gets the chance will leap fearlessly, never having learned any better. A dog kept caged will have little muscle, bone density or co-ordination. A bone has to be stressed by being used to build up density and strength. A dog has to have freedom to learn how to move. The owner must also be alert for danger points in the home, for instance, making sure all members of the family know to put dining chairs back under the table and perhaps putting a baby gate at the bottom of the stairs so the new puppy will not go mountaineering before it knows safety limits. Puppies between the ages of 5- 10 months are at most risk of leg fracture. At this time the bone is still ' green ' and forming rapidly so isn't as forgiving as the soft bone of the very young puppy but not yet ready to harden into mature bone that has ore strength. Of course most Italian Greyhounds don't suffer leg fractures and many people have the breed for years and never experience one, but with the best will in the world it can happen, just as it could happen to you or me. The first thing to do is calm yourself and your dog. The worst thing that happens is that the dog will usually scream very loudly however remember, this is not a terminal illness and once the initial shock has worn off, your Italian will be braver about it than you! However do take care not to get bitten as a dog in sudden pain will often bite the hand that is trying to aid it. The best way of doing this is to place your hand firmly around the dog's muzzle and talk to it gently until it quietens down. This is essential if there are other dogs around as the noise can aggravate the pack instinct and will cause them to attack the injured dog. Get someone to drive you to the vet whilst holding the limb gently immobilized, or if you are alone carefully place the dog in a crate well packed round with soft quilts or blankets to stop movement. Once the patient has been given first aid and the leg is comfortably splinted you will be able to discuss with your vet the best course of action. Plating or pinning is generally the best option as a leg set in plaster will usually move and can buckle over at a later date. It is probably advisable to ask your vet to send your dog to an orthopaedic specialist. Many dogs have gone on to have a successful show career after a fracture and even compete in dog agility events. A more common break is a tail. This fine whippy tail coupled with a happy carefree dog results only too often in a tail hitting the edge of the door or corner of a coffee table. This can be set easily if noticed in time as some dogs appear to feel little or no pain although others find it exceedingly painful. There are two ways to set this successfully. You can use either the soft stick from a cotton bud and use it to splint the tail with micropore or take a square of adhesive tape and putting it on a flat surface place the tail on top of it and then secure with another square of adhesive tape, trimming the excess at either side of the tail. The important thing is not to wrap anything too tightly around the tail as this will stop the blood supply and you will find the tail has inadvertently been amputated!! If in doubt consult your vet. Sometimes one of the joints in the tail dislocates and it can be quite difficult to tell the difference between that and a fracture. Very often no treatment for either problem is needed other than medication to reduce pain and swelling. Like most small breeds Italians are prone to infection in the gums known as gingivitis and also infection in the bone known as periodontal disease. Not only is this an unhealthy condition for the dog but it is also unpleasant for the humans around it! Fortunately this is preventable with good diet and regular oral hygiene. It is easy to train a young puppy to have his teeth cleaned. Although it is not necessary to clean the milk teeth it is wise to get your puppy used to a tooth cleaning routine even at this tender age. All that is necessary at this stage is to rub some tasty doggy toothpaste ( never use the human variety ) around his teeth and gums with your finger. Then encourage him to chew on a tooth brush (child size ) with some of the tasty paste on it! Gradually introduce him to gentle brushing and when his permanent teeth come through to firmer brushing. Circular movements are the best paying particular care to remove particles of food from around the gum margin. Bleeding gums are a sign of infection and this means stepping up the routine to brushing every day. Your vet can advise you on other steps that may be necessary such as anti- bacterial toothpaste or professional scaling and polishing. It is essential to give the best quality food if you want optimum health, bright eyes and that fine soft silky coat which is such a feature of the breed. I feed natural food as much as possible but not everyone agrees with this, preferring perhaps a more convenient method, not being quite sure how to feed a natural diet. For anyone interested in learning more about natural feeding, I can recommend a book by Dr. Ian Billingshurst called 'Give Your Dog a Bone'. Whatever you feed, these are small, high energy dogs so only the best quality will do. On the Links page you will find sites that are of particular interest to owners who wish to try more natural and holistic feeding methods. 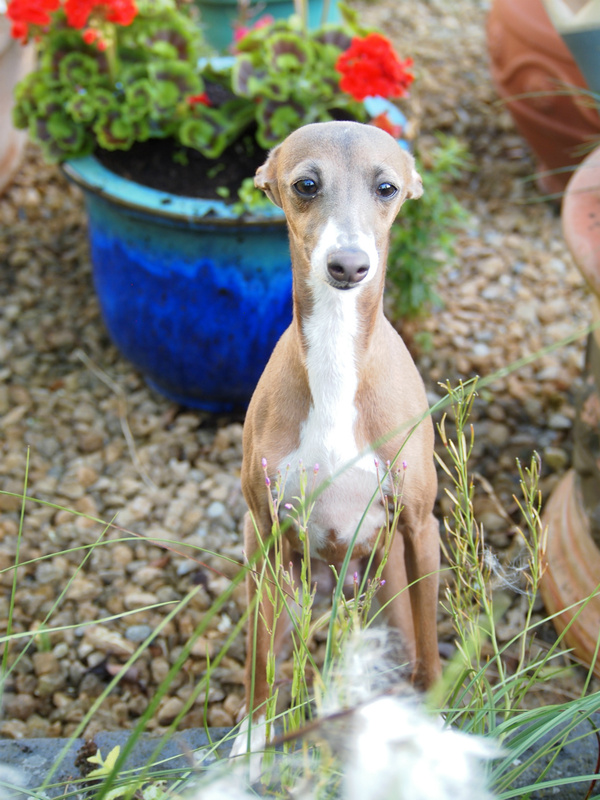 Italian Greyhounds sometimes suffer with colitis. Very often it is due to poor feeding and stress. Sometimes there is no known cause. One of my dogs has had chronic colitis for about 10 years and in spite of every investigation and treatment the vet could give him ( including steroids ) very careful diet, and TLC he would have just short periods of relief only to start once again with painful stomach cramps, vomiting and diarrhoea containing blood and mucus. A few months ago a friend told me she had been treating her dog for a similar condition on the advice of her vet, with Glucosamine, which is more usually used for painful joints and arthritis. This has been like a miracle, since starting him on a daily dosage he has not had a bad attack for over 4 months. The dosage is 500 to 700 mgs daily and is available from Health food shops. Even better possibly is L- Glutamine again available from Health Food shops. If anyone else has a dog of any breed with this distressing illness I recommend you try it. I am informed it works equally well on cats. I am forever grateful for having been told about this and so is my dog! Enjoy and love your dog and hopefully you will have many carefree years together. A man takes his Deerhound to the vet and says "My dog's cross-eyed, is there anything you can do for him? "Well" says the vet "let's have a look at him." So he picks the dog up and examines his eyes, checks his teeth etc. Finally he says "I'm going to have to put him down." "What? Just because he's cross-eyed???" We recently received this email which we feel is well worth reproducing. We have had problems in this area too and know of others that have had cataract operations for posterior cataract. For instance our own Artmeis Fancy Free developed them at 8 years old although retains some sight at 12/2 years. We have removed the names of sires and dams but will contact those breeders so that they are aware of the problem which is known have heritable components. We would be grateful for input from anyone else who has had experience with this problem. 6 months he was totally blind. It was heartbreaking to watch him becoming introverted and not able to join in playing with the other two. However , he did adapt well and continued his duties as a Pat Dog bringing much pleasure to the nursing home that he still visits. We were lucky that our Insurance covers treatment for this ailment and we took the decision to have surgery and our local vet recommended The Willows Practice near Birmingham. They removed the cataract from the most favourable eye successfully which transformed Lorenzo's life....we were thrilled with the results. This March we noticed that Lorenzo' s son Elio, aged 7 was beginning to show the same symptoms and we took immediate action in taking him to our local vet who confirmed early cataracts in both eyes so we have just returned from another trip to Birmingham to collect Elio from the same surgery as his father. We are now into the 2nd week after surgery and touch wood he is doing very well but it is still early days. We find it strange that after thoroughly researching the breed,we found no mention of cataracts but as these aren`t age related cataracts wonder whether we were unlucky or they just weren`t being reported. We believe that you are right to introduce new bloodlines from abroad as perhaps the UK gene pool is too small ,causing these problems. It has been very distressing for us to go through this twice and hope IG breeders act responsibly to breed for soundness and not just beauty.